John “Jack” D. Dean, 87, of New Vienna, passed away at Autumn Years Nursing Center on Saturday, January 19, 2019. Jack was born in Mt. Orab on March 24, 1931, the son of Pearl and Robert Dean. He was married to Evelyn Mongold Dean on February 12, 1950, who preceded him in death on November 8, 2013. 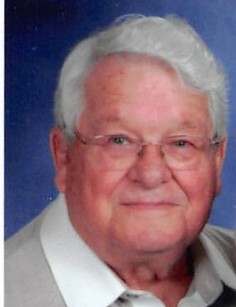 A 1949 graduate of Martinsville High School, Jack was a member of St. Columbkille Catholic Church. He was a dairy farmer for many years. He also ran his feed store, sold seed corn and liquid fertilizer, all this led to Jack finding his true calling in life – to be great salesman, and meeting and helping his customers. Jack is survived by his daughters: Jacky Walker of New Vienna and Patty (Darrell) Saylor of Wilmington. Also left to cherish his memory are grandchildren: John (Sue) Walker, James (Vicky) Walker, Jenifer Gibson, Jonathan Terry, and Garrett (Michelle) Turner; great grandchildren: Lee, Tyler (Renee), Kateyln, Emily, Justin, Zachary, Clara and Ethan; great-great granddaughter, Aria; and brother, Bernard (Margaret) Dean of New Vienna. In addition to his wife Evelyn, Jack was preceded in death by their daughter, Mary L. Turner; granddaughter, Amy Terry; and brother, Robert Dean Jr.
Mass of Christian Burial will be held at St. Columbkille Catholic Church on Wednesday, January 23, 2019, at Noon. Friends may call ,at the church, from 10am until 12pm. Burial will follow at the New Vienna IOOF Cemetery. Arrangements have been entrusted to Littleton Funeral Home, Sabina.